At the core of every marketing and public relations effort is the story you want to tell. 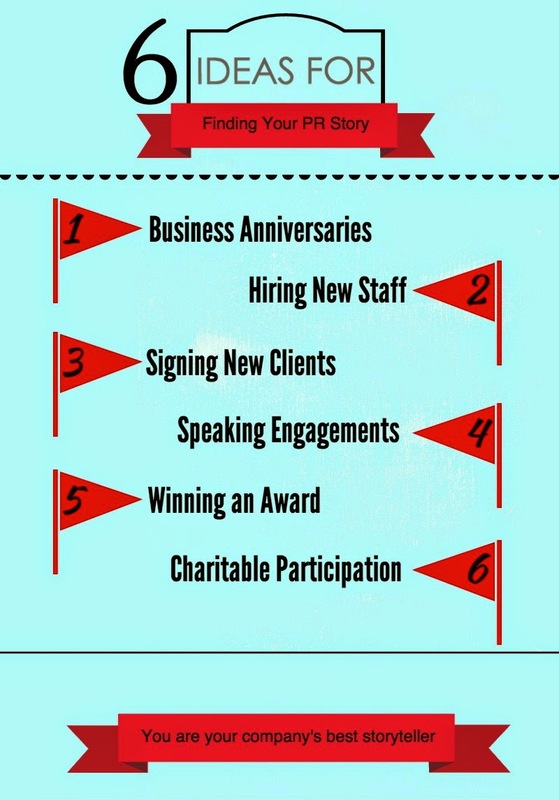 We recently shared several possible story ideas for new or small business owners. Publications that the member groups produce - chambers of commerce and professional organizations often put out newsletters or magazines aimed at members. Where do most of your customers / clients come from? If the majority of your customers or clients hail from a specific audience - people who practice a particular trade, for example - find out if any specialized magazines or newsletters cater to that audience and get in touch with them. Likewise for any important new hires. If that person is a well regarded specialist in a particular field, their change of employment could be a news item for any publications that cater to that profession. Does your business benefit from B2B relationships? 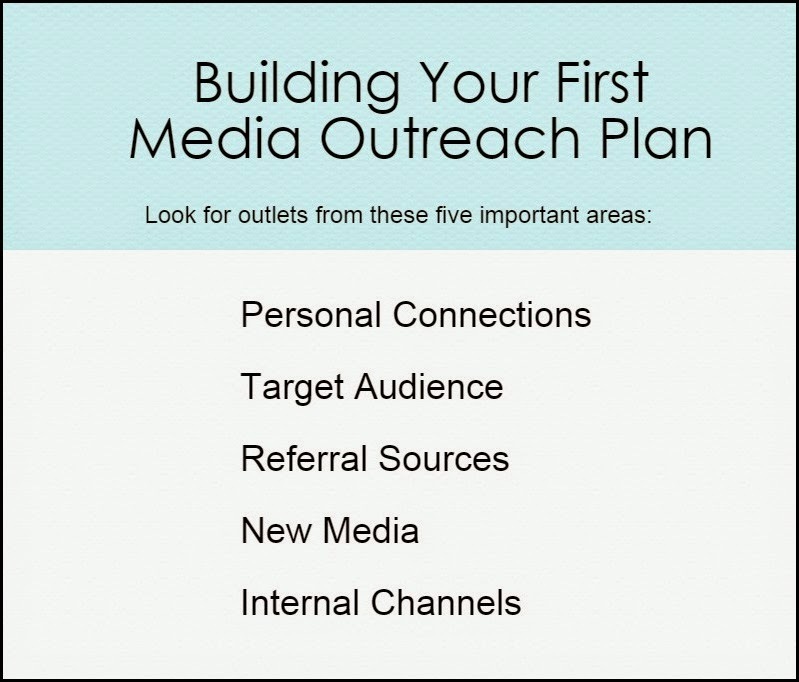 If other business owners are your best referral source, you want to be in the publications they read. Look for a regional business journal operating in your area and make a habit of dropping the reporter who covers your industry a line to let them know what's going on in your shop. They appreciate being kept in the loop, even if they don't respond to every piece of information you send them. Does your area have any independent news websites or blogs covering local business? Don't underestimate the reach of these relatively new information channels. People read them, and their editors want to hear from you. Do you have your own website? Of course you do. But do you have a “news” section on that website? You should. And you should post your news story there. Then you should share the link to that page in your email signature (updated regularly), on your company’s social media channels, and in your company’s electronic newsletter. If you don’t have a formal newsletter, send the link to clients you think might be interested in reading about your news. Media coverage is just one ingredient in a well-rounded public relations plan, but it is a significant one. Journalists want to tell good stories, especially about people. But they can't tell the stories they don't know about. Make it easier for them to tell your story. Every time the news comes on, there’s a report of an outbreak of a new virus, making influenza season seem like a walk through a field of daisies compared to what we’ve been finding out about the new Enterovirus D68 (EV-D68) and Ebola. Influenza, however, hospitalizes more than 200,000 Americans every year, and kills an estimated 36,000. Ebola, meanwhile, has infected only nine people in the United States, eight of whom recovered after treatment. In short, you and your workplace are much more likely to be affected by the flu this winter than Ebola. There is no way to predict the severity of the upcoming flu season, according to the U.S. Centers for Disease Control and Prevention, but preparing to deal with it is well worth the time. Review preventative measures, as well as things you can do to help yourself stand back up and smell the flowers again, should you fall face first into the field. If you’re in a high-risk group, or, say, you take public transportation every day, or work in a hospital or school or your job is in an office with dozens of others sitting nearby in cubicles, medical experts recommend getting a flu shot. If you have health insurance, you should be covered for free preventative care through your doctor. You also could get vaccinated at a pharmacy for a small fee or through your local health bureau. Check with your doctor, or your city or county’s department of health or community hospital for information. Nothing controls the spread of germs the viruses that cause colds and influenza like intentional, careful hand washing. By intentional, I mean taking time out of a busy day and just washing thoroughly, particularly if you’ve been traveling the hallways of a building, using elevators, escalators, public transportation or handrails and door knobs, grocery shopping, or handling money. Of course, you also should wash after sneezing, coughing, before and after eating and after using the restroom. Remember – everything you touch has been touched by someone else before you. Yes, everything. Knowing the right way to wash your hands is extremely helpful. It’s somewhere between the way a surgeon scrubs in for a procedure and the way a typical seven-year-old washes up for dinner! Here are a few steps from the National Health Service, in conjunction with the World Health Organization, that will help you know your hand washing is up to par at keeping the germs down and out. There are scores of over-the-counter medications and home treatments to ease the symptoms of colds and influenza. Do they work? It seems a subjective question. What may work for one person may not work for another. This article from WebMD.com lists many tips that may provide some relief. More than a few theories have been proposed regarding the cure-all properties of chicken soup. Until recently, little evidence has been available to back up the theory, but this article from the New York Times Well Blog outlines new evidence. Like the Clash, when we get sick, we ask ourselves this question over and over. Should I stay home or go to work? Trying to tough it out and go in to work is detrimental to everyone, you, your coworkers and lost production in the workplace. From a health perspective, if you can stay home, rest and drink lots of fluids and not infect anyone else at your workplace, that is the ideal solution. If you can work remotely, even if it’s part time, that would be even better. Is There an App for The Flu? So glad you asked! Yes, there are a few apps and Internet programs that will help you deal with the flu. FluVue is the Centers for Disease Control and Prevention’s official app and will help you see the severity of flu outbreaks in your state as well as videos, tips and hints on preventing or dealing with the illness. It is free and available on both Android and iTunes platforms. Flu Defender is an overall app for everything you need to stay healthy during flu season, including where to get a flu shot, how to determine if you have flu-like symptoms and real-time Tweets from the CDC. It is available for free from iTunes. If you don’t have a smartphone, Flu Near You is an online program administered by Healthmap of Boston Children's Hospital, in partnership with the American Public Health Association and the Skoll Global Threats Fund. It helps track the spread of the flu across the U.S. and offers information on where to get a vaccine, as well as links and resources to learn more than you ever thought possible about this annual illness. Hopefully these tips, tricks, ideas and warnings will help keep you and yours healthy this coming season.